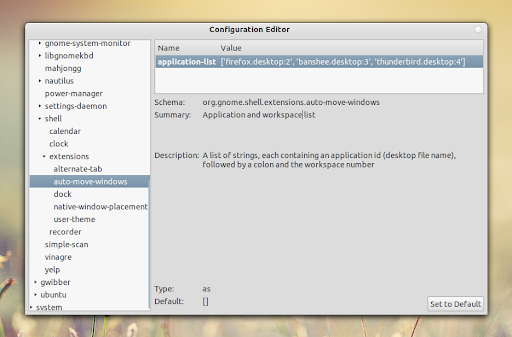 GNOME Shell Auto Move Windows extension can be used to get some applications to always start on a specific workspace. The extension is not new, but it is a bit difficult to use so I though I'd write a post explaining exactly how to get it working (tested on Ubuntu 11.10 Oneiric Ocelot and Fedora 15). GNOME Shell Auto Move Windows is an official extension so it's available in the Fedora, Arch Linux (AUR), etc. repositories. 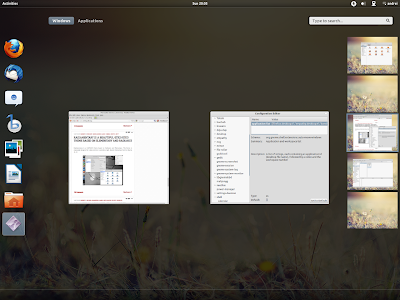 Then save the file and restart GNOME Shell or log out and log back in. gsettings set org.gnome.shell.extensions.auto-move-windows application-list "['APPLICATION.desktop:WORKSPACE-NUMBER','ANOTHER-APPLICATION.desktop:WORKSPACE-NUMBER']"
"APPLICATION.desktop" is the .desktop filename for an application which can be found in /usr/share/applications/. For example, the Firefox .desktop file under Fedora 15 is called "mozilla-firefox.desktop" while in Ubuntu it's called "firefox.desktop", etc. You can find out the exact names by going to /usr/share/applications or by running the following command in a terminal: "ls /usr/share/applications | grep APPLICATION"
gsettings set org.gnome.shell.extensions.auto-move-windows application-list "['firefox.desktop:2','banshee.desktop:3','thunderbird.desktop:4']"
The above command will set Firefox to open on workspace 2, Banshee on workspace 3 and Thunderbird on workspace 4. You can also edit this list by using "dconf-editor" (to use it under Fedora, install "dconf-editor" and under Ubuntu, "dconf-tools") - you'll find it under org > gnome > shell > extensions > auto-move-windows. Many thanks to bdeferme for the info!